LHCb collaboration, Observation of an excited Bc+ state, arXiv: 1904.00081. Y. Feng, J. He, J.-P. Lansberg, H.-S. Shao, A. Usachov and H.-F. Zhang, Phenomenological NLO analysis of ηc production at the LHC in the collider and fixed-target modes, arXiv: 1901.09766. R. Aaij et al., Performance of the LHCb trigger and full real-time reconstruction in Run 2 of the LHC, arXiv:1812.10790. LHCb collaboration, First observation of the doubly charmed baryon decay Ξcc++ →Ξc+π+, Phys. Rev. Lett. 121 (2018) 162002. LHCb collaboration, Measurement of the lifetime of the doubly charmed baryon Ξcc++, Phys. Rev. Lett. 121 (2018) 052002. LHCb collaboration, Measurement of Upsilon production in pp collisions at 13 TeV, JHEP 07 (2018) 134. LHCb collaboration, Search for excited Bc+ states, JHEP 01 (2018) 138. LHCb collaboration, Observation of the doubly charmed baryon Ξcc++, Phys. Rev. Lett. 119 (2017) 112001. LHCb collaboration, Study of charmonium production in b-hadron decays and first evidence for the decay Bs→φφφ, EPJC 77 (2017) 609. LHCb collaboration, Observation of the decay Bs→ηcφ and evidence for Bs→ηcπ+π-, JHEP 07 (2017) 021. M.K. Baszscyk et al., Test of the photon detection system for the LHCb RICH Upgrade in a charged particle beam, JINST 12 (2017) P01012. LHCb collaboration, Search for structure in the Bsπ invariant mass spectrum, Phys. Rev. Lett. 117 (2016) 152003. LHCb collaboration, Measurement of Bc production in proton-proton collisions at 8 TeV, Phys. Rev. Lett. 114 (2015) 132001. LHCb collaboration, Angular analysis of the Bd→K*0e+e- decay in the low-q2 region, JHEP 04 (2015) 064. LHCb collaboration, Measurement of the ηc(1S) production cross-section in proton-proton collisions via the decay ηc(1S)→ppbar, EPJC 75 (2015) 311. LHCb collaboration, Measurement of the Bc meson lifetime using Bc→J/ψμX decay, EPJC 74 (2014) 2839. LHCb collaboration, Study of J/ψ production and cold nuclear effects in pPb collisions, JHEP 02 (2014) 072. LHCb collaboration, Observation of the decay Bc→Bsπ, Phys. Rev. Lett. 111 (2013) 181801. LHCb collaboration, First observation of the decay Bc→J/ψK, JHEP 09 (2013) 075. LHCb collaboration, Measurement of B meson production cross-sections in proton-proton collisions at 7 TeV, JHEP 08 (2013) 117. LHCb collaboration, Production of J/ψ and Υ in pp collisions at 8 TeV, JHEP 06 (2013) 064. LHCb collaboration, Measurement of the Bd→K*0e+e- branching fraction at low dilepton mass, JHEP 05 (2013) 159. LHCb collaboration, Observation of the decay Bc→ψ(2S)π, Phys. Rev. D 87 (2013) 071103 (R). R. Aaij et al., The LHCb trigger and its performance, JINST 8 (2013) P04022. LHCb collaboration, Measurement of Bc production and mass with the Bc→J/ψπ decay, Phys. Rev. Lett. 109 (2012) 232001. LHCb collaboration, Measurement of the B± production cross-section in pp collisions at 7 TeV, JHEP 04 (2012) 093. LHCb collaboration, Measurement of b-hadron masses, Phys. Lett. B 708 (2012) 241. LHCb collaboration, Measurement of J/ψ production in pp collisions at 7 TeV, EPJC 71 (2011) 1645. S. Barsuk, J. He, E. Kou, and B. Viaud, Investigating charmonium production at the LHC with the ppbar final state, Phys. Rev. D 86 (2012) 034011. Y. Gao, J. He, P. Robbe, M.-H. Schune, and Z. Yang, Experimental prospects of the Bc studies of the LHCb experiment, Chin. Phys. Lett. 27 (2010) 061302. S. Deshcotes-Genon, J. He, E. Kou, and P. Robbe, Nonleptonic charmless Bc decays and their search at LHCb, Phys. Rev. D 80 (2009) 114031. J. He (on behalf of the LHCb collaboration), Recent LHCb results in charm spectroscopy, to appear in Proc. of the 39th International Conference on High Energy Physics (ICHEP 2018), Seoul, South Korea, Jul 2018, PoS (ICHEP2018) 211. J. He (on behalf of the LHCb collaboration), Studies of Bc mesons at LHCb, to appear in Proc. of the 39th International Conference on High Energy Physics (ICHEP 2018), Seoul, South Korea, Jul 2018, PoS (ICHEP2018) 146. J. He (on behalf of the LHCb RICH collaboration), Real-time calibration and alignment of the LHCb RICH detectors, Proc. of the 9th International Workshop on Ring Imaging Cherenkov Detectors (RICH 2016), Bled, Slovenia, Sept 2016, Nucl. Instrum. Methods Phys. Res. A 876 (2017) 13. J. He (on behalf of the LHCb collaboration), Electroweak penguins at LHCb, Proc. of the 37th International Conference on High Energy Physics (ICHEP 2014), Valencia, Spain, July 2014, Nuclear and Particle Physics Proceedings 273-275 (2016) 1370. J. He (on behalf of the LHCb collaboration), J/psi and Bc production at LHCb, Proc. of The 13th International Conference on B-Physics at Hadron Machines, Amsterdam, The Netherlands, April 2011, PoS (BEAUTY 2011) 026. I. Belyaev et al., Handling of the generation of primary events in Gauss, the LHCb simulation framework, Proc. of the 2010 IEEE Nuclear Science Symposium, Medical Imaging Conference, and Room Temperature Semiconductor Detectors Workshop, Knoxville, Tennessee, USA, Nov 2010, IEEE (2010) 1155. I. Belyaev et al., Handling of the generation of primary events in Gauss, the LHCb simulation framework, Proc. of The International Conference on Computing in High Energy and Nuclear Physics (CHEP 2010), Taipei, Taiwan, Oct 2010, J. Phys. : Conf. Ser. 331 (2011) 032047. S. Barsuk, J. He, E. Kou, and B. Viaud, Charmonium hadroproduction studies via pp at the LHC, Proc. of the Workshop “Three Days of Quarkonium Production in Proton-Proton and Proton-Nucleus Collisions”, Palaiseau, France, July 2010, NPB (Proc. Supp.) 214 (2011) 169. S. Descotes-Genon, J. He, E. Kou and P. Robbe, Non-leptonic charmless Bc decays (and their search at LHCb), Proc. of The 2009 Europhysics Conference on High Energy Physics, Krakow, Poland, July 2009, PoS (EPS-HEP 2009) 210. J. He (on behalf of the LHCb collaboration), Measurement of Bc mass and lifetime at LHCb, Proc. of The XVII Int. Workshop on Deep-Inelastic Scattering and Related Topics, Madrid, Spain, April 2009. M.K. Baszscyk et al., Test of the photon detection system for the LHCb RICH Upgrade in a charged particle beam, CERN-LHCb-PUB-2016-019. LHCb collaboration, Search for structure in the Bsπ invariant spectrum, CERN-LHCb-CONF-2016-004. LHCb collaboration, LHCb PID Upgrade Technical Design Report (TDR), CERN-LHCC-2013-022. LHCb collaboration, First analysis of the pPb pilot run data with LHCb, CERN-LHCb-CONF-2012-034. Y. Gao, J. 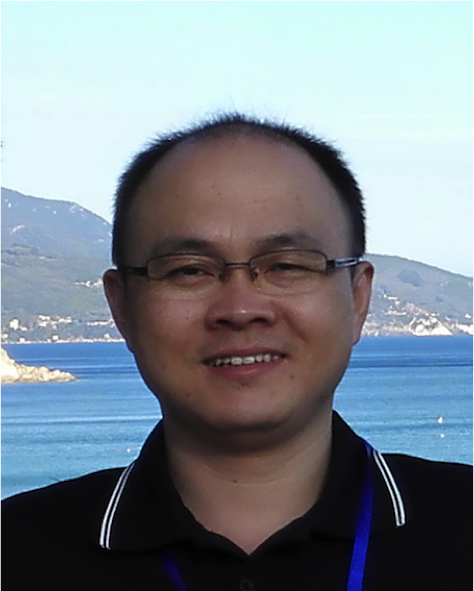 He and Z. Yang, Study of the Bc lifetime measurement using the exclusive decay Bc→J/ψ(μμ)π at LHCb, CERN-LHCb-2008-077. Y. Gao, J. He and Z. Yang, Event selection of Bc→J/ψ(μμ)π and estimate of the event yield, CERN-LHCb-2008-059. Recent LHCb results in charm spectroscopy, ICHEP 2018 (The 39th International Conference on High Energy Physics), Seoul (South Korea), July 4-11, 2018. Studies of Bc mesons at LHCb, ICHEP 2018 (The 39th International Conference on High Energy Physics), Seoul (South Korea), July 4-11, 2018. Prospect of LHCb for singly and doubly charmed baryons, Workshop on singly and doubly charmed baryons, LPNHE, CNRS/Sorbonne Universite, Paris (France), June 26-27, 2018. Real-time calibration and alignment of the LHCb RICH detectors, RICH 2016 (The 9th International Workshop on Ring Imaging Cherenkov Detectors), Bled (Slovenia), September 5-9, 2016. Experimental review of pentaquarks and tetraquarks, FPCP 2016 (The 14th Conference on Flavor Physics and CP Violation), Caltech, Pasadena (USA), June 6-9, 2016. Bc studies at LHCb, QWG 2014 (The 10th International Workshop on Heavy Quarkonium), CERN, Geneva (Switzerland), November 10-14, 2014. Heavy quark production, ISVHECRI 2014 (The 18th International Symposium on Very High Energy Cosmic Ray Interactions), CERN, Geneva (Switzerland), August 18-22, 2014. Electroweak penguins at LHCb, ICHEP 2014 (The 37th International Conference on High Energy Physics), Valencia (Spain), July 2-9, 2014. ATLAS & LHCb upgrades relevant for heavy flavor & onium production, SGW 2013 (The First SaporeGravis Workshop), Subatech, Nantes (France), December 2-5, 2013. Bottom production, spectroscopy, lifetime, PIC 2013 (The XXXIII international symposium on Physics in Collision), IHEP, Beijing (China), September 3-7, 2013. Heavy-flavour and quarkonium results in pp, The First SaporeGravis Day Meeting, IPN, Orsay (France), November 23, 2012. Latest flavour physics results from LHCb, Latest Results From the LHC (ICHEP 2012 Summary), CERN, Geneva (Switzerland), July 12, 2012. Bc studies at LHCb, QWG 2011 (The 8th International Workshop on Heavy Quarkonium), GSI, Darmstadt (Germany), October 4-7, 2011. J/ψ and Bc± production at LHCb, BEAUTY 2011 (The 13th International Conference on B-Physics at Hadron Machines), Amsterdam (The Netherlands), April 4-8, 2011. Charmonium hadroproduction studies via pp at the LHC, Three Days of Quarkonium Production in Proton-Proton and Proton-Nucleus Collisions, Ecole Polytechnique, Palaiseau (France), July 29-31 2010. Heavy quarkonia studies at LHCb, ReteQuarkonii Thematic Day, IPNO, Orsay (France), February 9, 2010. Measurement of Bc+ mass and lifetime at LHCb, DIS 2009 (The XVII International Workshop on Deep-Inelastic Scattering and Related Subjects), Madrid (Spain), April 26-30, 2009. Bc studies at LHCb, FCPPL 2012 (The 5th France China Particle Physics Laboratory Workshop), LAL/Saclay, Orsay (France), March 21-24, 2012. LAL-Tsinghua Activities in LHCb, FCPPL 2010 (The 3rd France China Particle Physics Laboratory Workshop), IPNL, Lyon (France), April 7-10, 2010. Bc studies at LHCb, FCPPL 2009 (The 2nd France China Particle Physics Laboratory Workshop), Central China Normal University, Wuhan (China), March 21-24, 2009.